It is possible to create an interview like situation while the learner attends to the principal task of sketching. 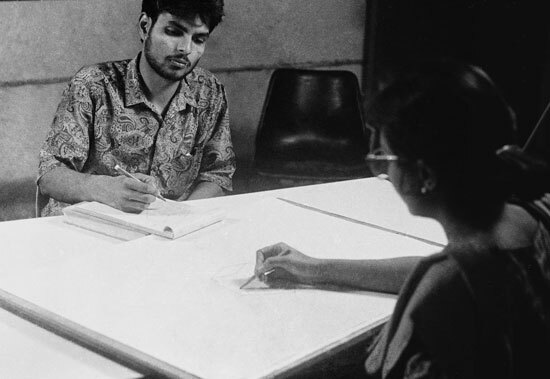 The partner simultaneously conducts his viva in a familiar but unrelated subject, verbally addressing questions and writing down his replies. The competence is in maintaining fluency in simultaneously tackling both the tasks. The challenge, on the face of it, looks difficult, but in reality it is not impossible to achieve. Experience with students show that they are able to handle a viva together with a sketching task and perform reasonably well. It suggested that if you have to use sketching to support the thought process, the action of sketching 3D objects must become routine and near natural like eating and walking. The aspects like fluency and speed of sketching become important. The sketching during the early creative phase should not demand continuous use of cognitive resource, so that it can be deployed for creative problem solving. It identifies factors that could lead to near natural sketching. It also suggests underlying principles and an action plan for sketching to become fluent and natural. The ideas were then woven into three anchors. This section includes suggestions on how to evaluate the level of competence achieved. dealing with conversion of these observations and ideas into a concrete action plan to help the learning of sketching in steps.